Owning a retail business I found this book reminded me of the simple requirements to run a complex business and emphasized the need to be ever vigilant and embrace new technology. It made me make several realizations about our state of affairs which more than reimbursed me for the time spent. However my kids complained every second as we drove listening to it. Don Soderquist was a man Sam Walton desperately wanted in his camp. 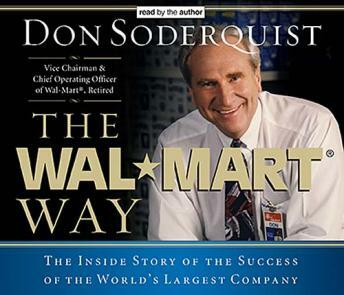 He recruited him for years and Soderquist was an essential part of taking Wal-Mart from a really good regional discounter to the goliath it is today. I wanted to hear his story..........unfortunately, that ISN'T what this book was all about. It was a mish-mash of 'how to' and self-help that failed to hit the mark with me. I'm not certain who Mr. Soderquist was intending as his audience for this work but it wasn't the avid historical reader. The Wal-Mart story is one of the most fascinating in the history of American business (Sam Walton's "Made In America" 'autobiography' was excellent) and I'd like to read more about it. I'm afraid Mr. Soderquist shed very little new light on what I already knew about the company and its trail to success. After knowing the truth about Wal-Mart and their tendency, at least according to what I've read in the press, to cheat the little man who must wear the blue vest every day and to continue to withhold from women what they have rightfully earned, this book read like a fairy tale. I could not get past the first CD. I think Mr. Soderquist must have the longest ams in the world...how else would he have been able to pat himself and Wal-Mart on the back non-stop. This is not even worth your time.